The Time Tracking and Logging Gadget can be added to your Jira dashboard, and then allows you to view and input worklog (time) records directly from the dashboard. 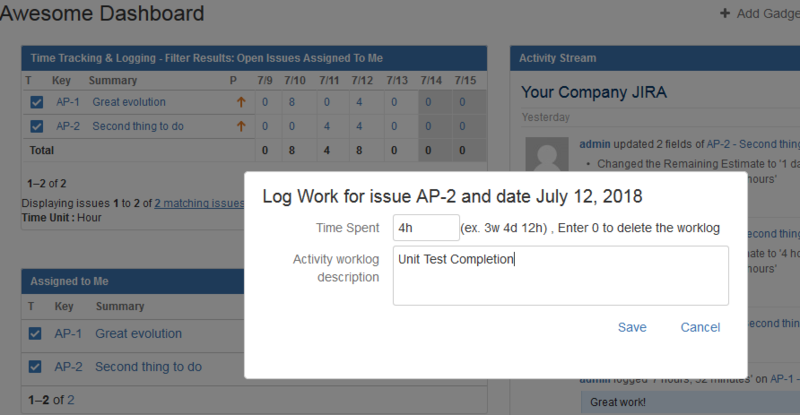 You see the work log on the filtered issues, and you can click on choosen date for issues you have rights to work on, in order to input your work log. 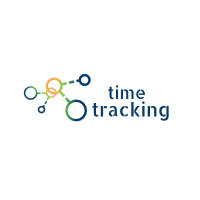 Time Tracking and Logging Gadget is a great way to visualize (and edit) your timesheet from the Dashboard. Columns are configurable so all your revelent information for you is displayed along with the timesheet. A worklog is clickable if have right to entry work log on this issue. Choose a filter, the columns you want to display, and many other display options and enjoy your timesheet configuration from your dashboard. 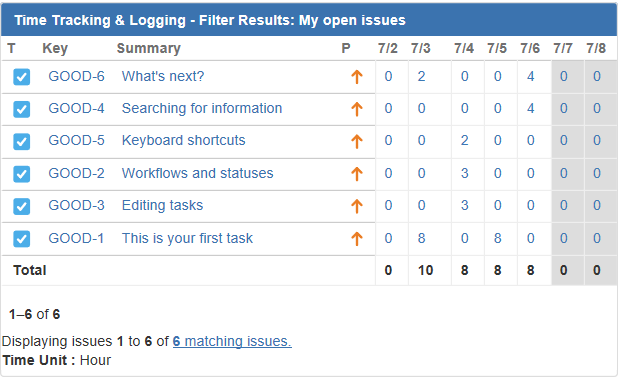 Being able to input worklog directly from your filtered issues displayed in your dashboard is a great time saver. You will not have to navigate in each issue to log your work! You can delete woklog by stting the time to "0". You can add as many Time tracking and Logging from Dashboard gadget as you want on your dashboard, if you want to split by different filters (by project for example). Each instance of the gadget is independant. 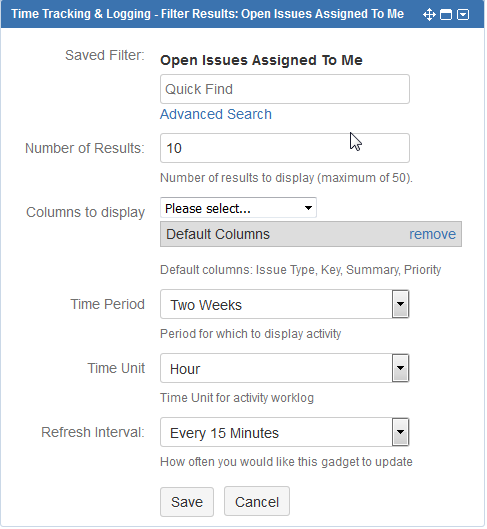 You first choose a filter to see only the issues you want to see/update the workloads (ex: My open issues), and you&apos;ll be able select a day and input work time and comment (description). The gadget is then refreshed to show you all workloads for the issues from your filter (week or two week views). Pro Tip: Take care of the sort order the filter you select is based on. A filter sorted by update date will make your timesheet to reorder each time you log time on one of it&apos;s issues. A prefered filter order is to filter by Key for example. Refresh interval (the gadget will refresh himself) at this specified interval to include new worklog set on issues. It will refresh automatically when a work log is set through the gadget.